Whether you’ve tried to grow cucumbers before or not, it’s easy to see from the size and weight of a cucumber that the plant needs support. While there are any number of ways to support a growing cucumber plant, one of the easiest supports to find is the covered tomato cage. The reason a tomato cage works so well is because it’s made of metal for strength, and is coated, or covered, in a protective material to keep the metal from rusting for added durability. Using a covered tomato cage for growing cucumbers can make both maintenance and harvesting easy. Plant your cucumber seedling in loose soil full of rich, organic matter such as compost or humus where it will be in full sun for at least six to eight hours a day. You’ll need the soil where your cucumber is planted to be well-draining so water doesn’t pool for long periods of time. Set a tomato cage over the cucumber seedling as soon after planting as possible. Adjust the cage so that the cucumber is in the direct center of the tomato cage with equal distance from the seedling to the sides of the cage all around. Water and care for your cucumber as needed for your area and wait as the plant begins to grow longer. If there is more than one seedling present (two to three is ideal), then gently move the stems to encourage the seedlings to grow in opposite directions. Secure the seedling vines once they are 1 to 2 feet tall along the tomato cage with a loose plant tie. Gently persuade the tendrils of the plant to curl around the cage as well for added natural support without breaking them off by mistake. Continue to encourage the cucumber plant to grip the tomato cage as it grows taller. Add more plant ties as needed if the plant appears to be weighted down and can’t hold itself to the cage. 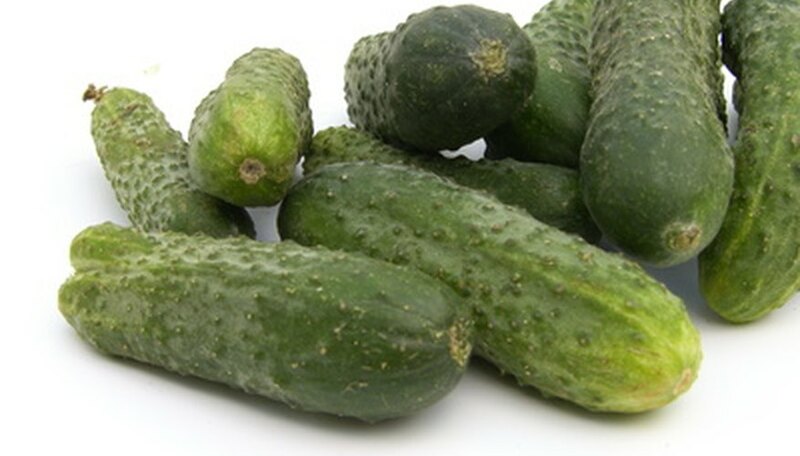 Be sure to harvest your ripe cucumbers as soon as they are ready to not only relieve the plant, but also to encourage it to produce more cucumbers. Powdery mildew can quickly take over a cucumber plant and kill off any chance of a harvest. Be sure not to wet the leaves when you water and make sure you aren't growing too many plants too close together. Treat for powdery mildew at the first sign of the dusty, white appearance on the leaves.